"Oh, Dakuwaqa!" 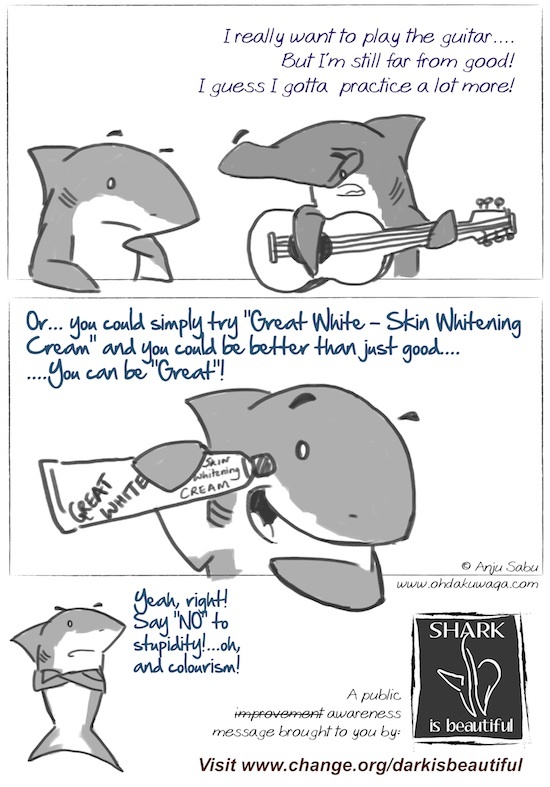 - The Shark comics and cartoons: Say 'No' to stupidity and colourism! 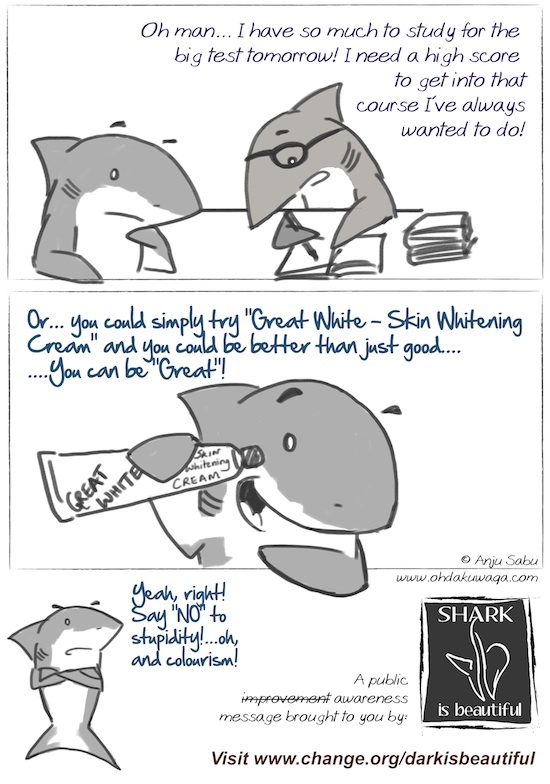 Say 'No' to stupidity and colourism! Even though we don't like to admit it and like to keep pretending that we're a country of mosaic culture united in diversity, India is one of the biggest practitioners of apartheid in the world. There will be a multitude of people who will get all "offended" or "angered" by my statement and may get all hostile but that's how we tend to avoid issues. We get angry at those who point out the issue than at the issue itself. Whoever established this mindset has very conveniently allowed things like discrimination, low self-esteem and exploitation to go unchecked. How else can a country with one billion skin tones continue to be the largest market for skin whitening creams? And a country where people actually believe these products work! You cannot change your skin colour from a deeper shade of brown to a paler version of pink. It just cannot happen. No cosmetic product can do that. Maybe if you tried acid? There are people with actual skin problems who are in need of proper skin care; and in India, sun screen is probably a better product to sell. I'm shocked that they could package a mix of sun screen and bleach and sell it as a "fairness cream" - how blatantly offensive is that? Whatever happened to respect and allowing people to succeed based on skill rather than skin? At what point does skin colour go from being "successful" to not? Is there some logical cutoff shade with a pantone code perhaps? "Dark is beautiful" is a campaign that talks about this discrimination against skin colour. They are currently campaigning against irresponsible advertising and propaganda that promote the idea that your skin colour determines how successful you are to be. Please sign the petition here if you believe that India needs to get over this so-called hangover we're still suffering from after The Raj. It's been over 60 years. Move forward. To view the commercial click here - it's sad when such influential celebrities promote such an idea. This ad agency needs some real creativity and some integrity.